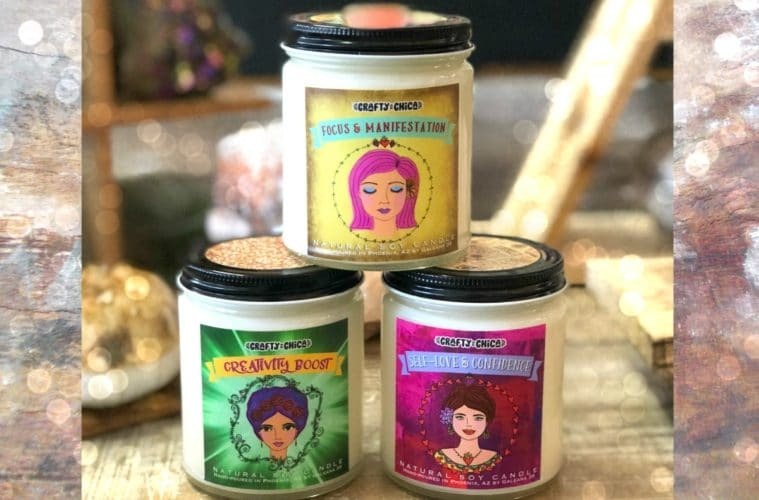 These Crafty Chica Affirmation Candles have been months in the making! I’ve ALWAYS wanted to have my very own candle line. I knew exactly what it would consist of – affirmations! This is how it all came together – our Phoenix shop, Mucho Mas Art Studio shares a building space with another small business called Galeana 39. Curtis Parhams, the owner is a long time friend of mine and Patrick’s. Long time as in before we were even married! Anyway, Curtis’ main focus of his store is the decadent artisan soy candles he creates. He makes and sells hundreds of these! 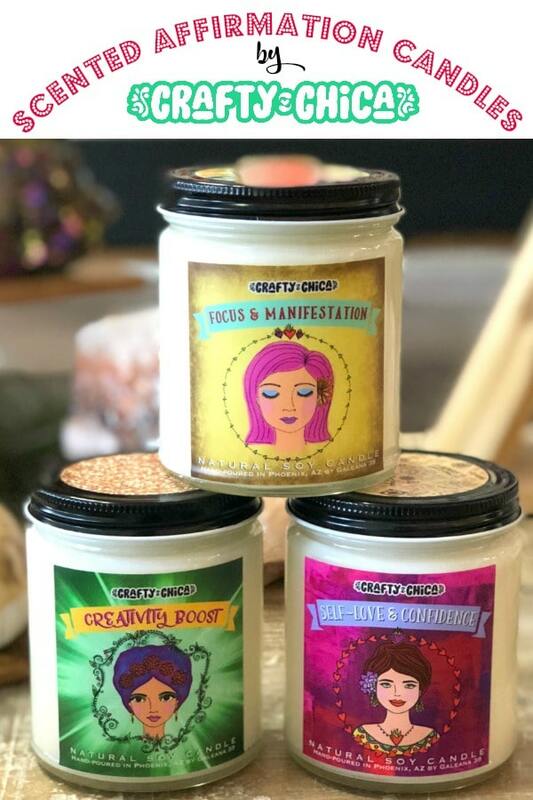 He’s the real deal when it comes to producing gourmet candles, so we partnered up to create this line of Crafty Chica Affirmation Candles! I spent the last few months sketching out titles, illustrations for the labels, scents, and themes. I started with 12 ideas and whittled them down to three. 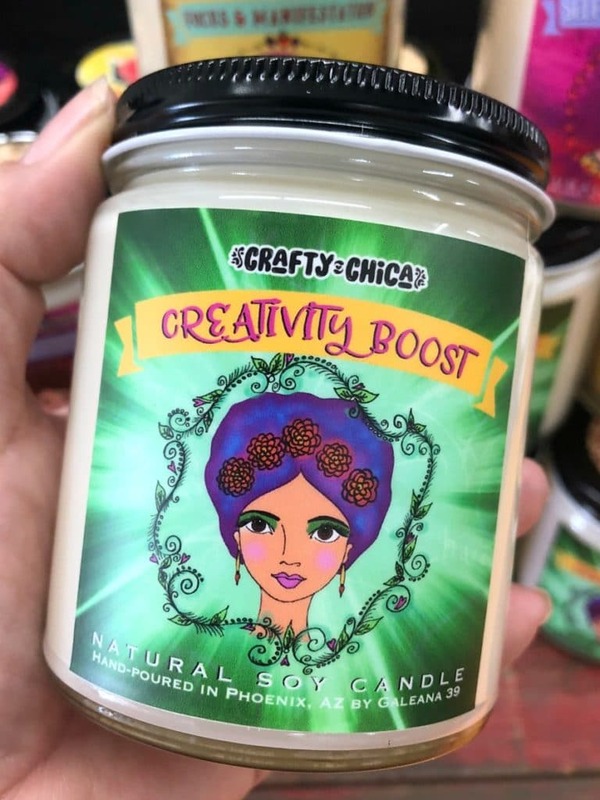 This candle is called CREATIVITY BOOST! It is a citrus mint aroma to awaken your senses! This candle represents celebrating YOU and your creative spirit. Giving yourself permission to experiment, make mistakes, learn, grow and give life all the glitter you’ve got! 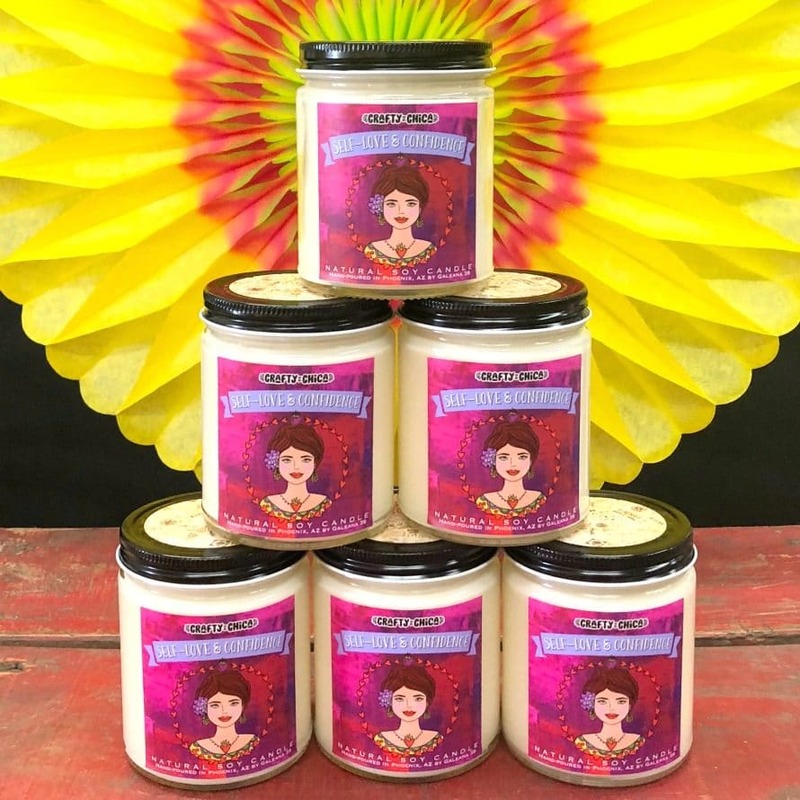 This is a good candle to burn when you are crafting, writing, singing, anything creative! It will awaken your senses! 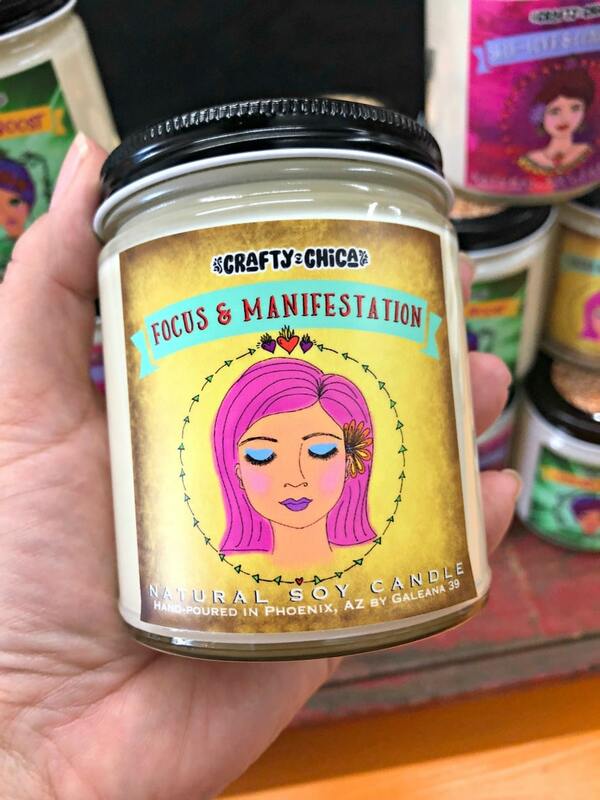 This candle is called FOCUS & MANIFESTATION! It is a floral aroma. This candle represents taking time to stop and smell the roses, so to say. Chill, breathe and get a clear vision of what you want out of every situation in life. This is something I practice daily, I always focus on my end goal to help bring good energy and manifest the best things in life. This candle is called SELF LOVE & CONFIDENCE! It is a sweet, pastry-inspired aroma. 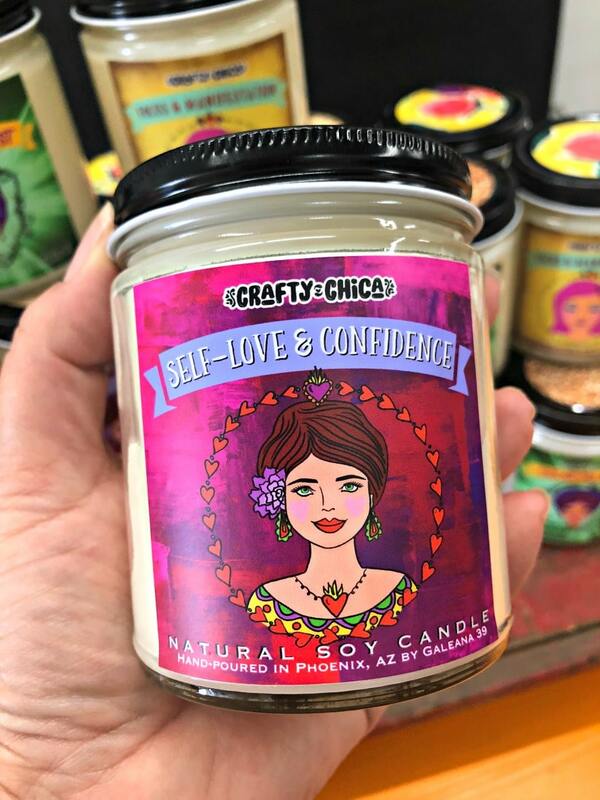 This candle represents loving yourself for who you are, embracing your best qualities and most of all – living the sweet life! Anyone who knows me knows I love me some desserts and this candle celebrates the excitement of indulging and being happy to do so. Even if it is just a scent! 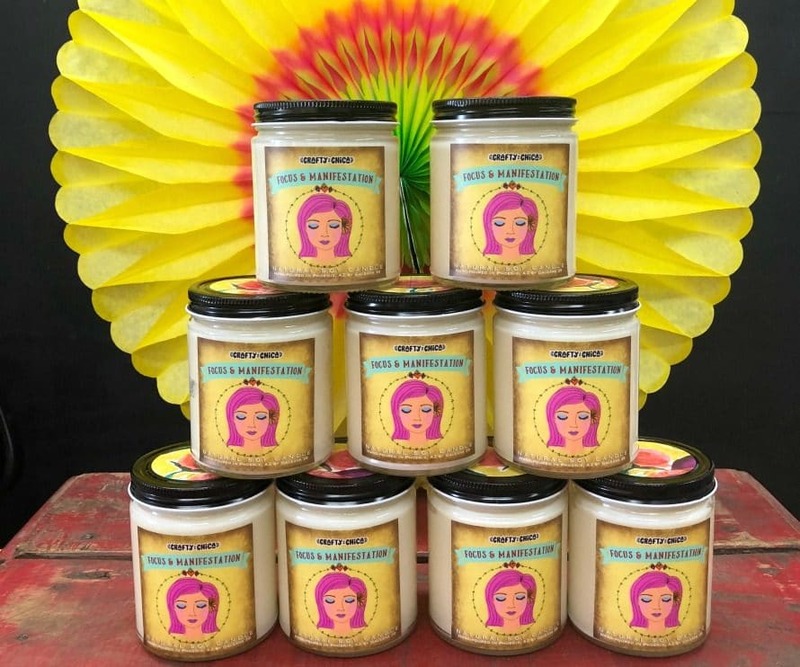 I hope you are as excited about these Crafty Chica Affirmation Candles as I am! I have no idea what to expect as far as if people want or need these. We made 24 and so far seven have sold. If it goes well, we’ll make another batch. But I do know it feels wonderful to complete a longtime dream/goal and see it in a physical REAL form. And let me know if there are any scents or themes you love! 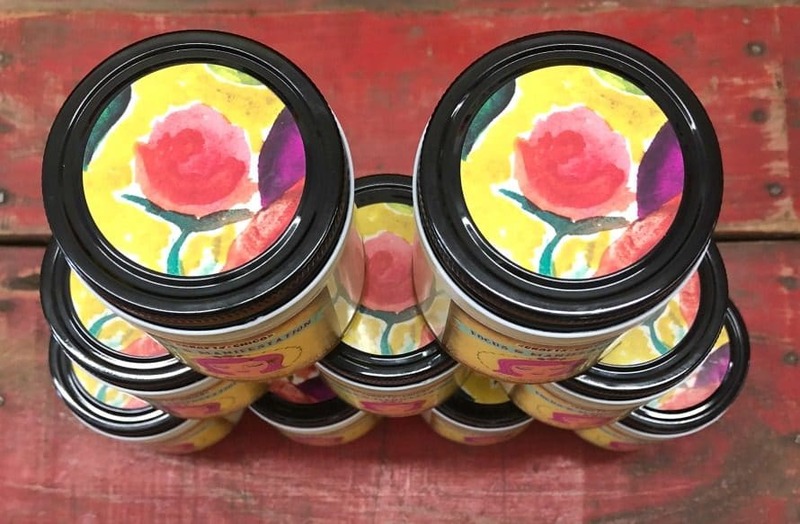 Each one features an original illustration for the label, as well as on the top of the candle by me. Warning label with burning instructions on the bottom of each candle. – Approximate burn time is 53 hours, 8-ounce candle. – 100% natural soy wax candle. – Small batched hand-poured in Phoenix, AZ. – Phthalate-free fragrance oil and/or essential oil. RELATED: Crafty ideas for paper crafts! 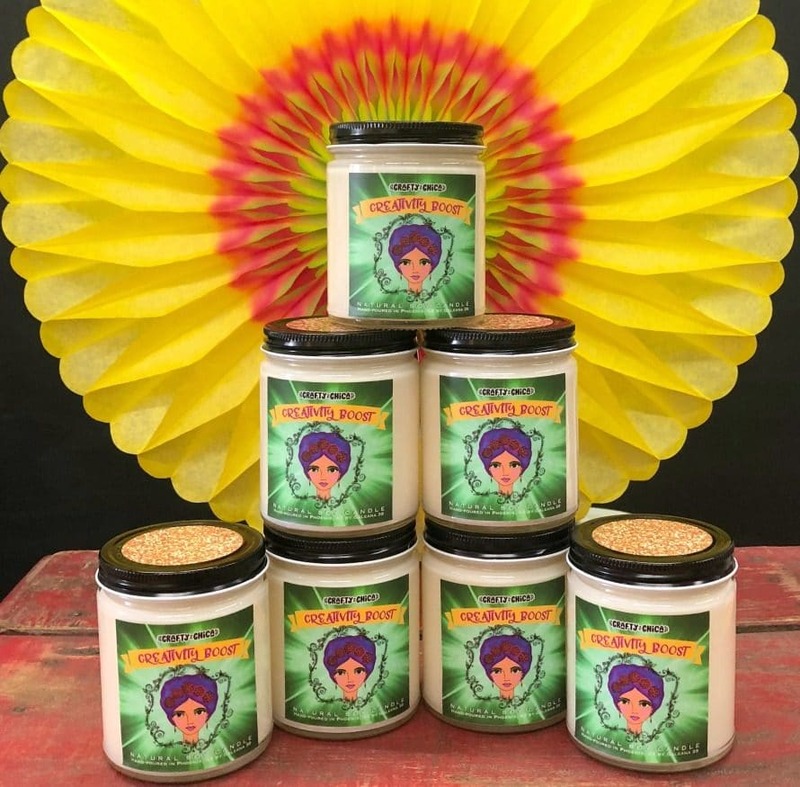 Click here to see all my candles for sale! I am a new follower but I already have been inspired. I particularly like the way you pay homage to (What I am assuming is) your ancestral heritage and culture. That, along with the bright colors of your beautiful crafted items and your positivity is a winning combination in my opinion! Thank you for sharing! These are SPARKLYICIOUSNESS….the 3 themes are so relatable, needed and empowering. Your drawings/art continuously amaze me with your absolutely delightful Crafty Chica Way! I really want the Creativity Boost…OMG!!! These will definitely sell out. Are we able to purchase them online as of yet? Much success your way with your candles!!!! Light it up with your sparkly self!!! !